RT156-117 Class 156 - Set Number 156453 First Barbie Livery. This highly detailed model is a limited edition First Liveried Class 156 in Barbie Livery and is limited to 200 pieces only. 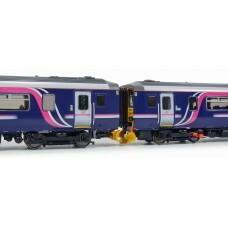 ·ScotRail Purple Seating, Fitted Toilet, Drivers cab detailing, Operational door lights (On DCC Only), Bi Directional Lighting, Carriage lighting, High Specification Underframe. ·Branded in First Barbie Livery, BSI Couplings, Stainless exhaust cover & full HSE Labelling on bodyshell & underfloor, High specification paint finish & Decals. ·Motorised in both cars (As per the prototype) on the rear bogies, fitted with a Low profile, micro geared drive system which allows for a high level of underfloor detailing.